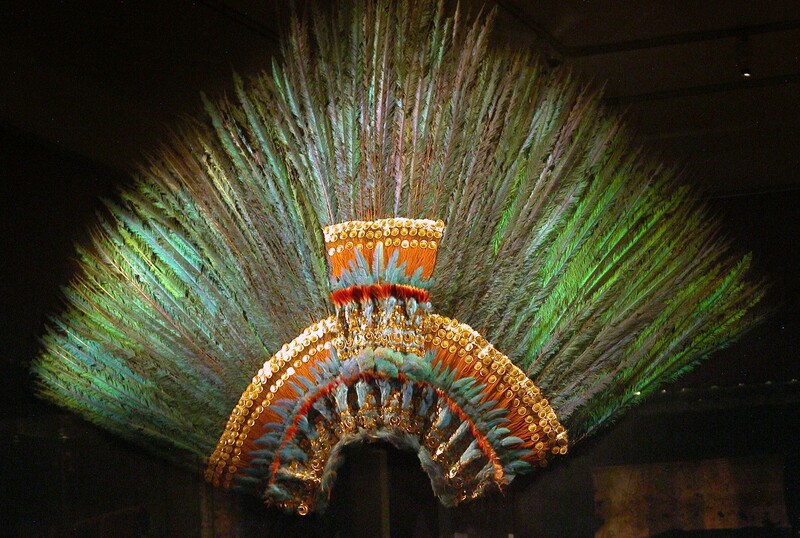 Moctezuma’s headdress is a large and elaborate 16th century crown which according to legend once belonged to Aztec emperor Moctezuma II, made from the iridescent green tail feathers of the Resplendent Quetzal. Moctezuma either gave it to Hernán Cortés as a gift upon his arrival at Tenochtitlan, the capital of the Aztec empire and modern day Mexico City, or it was pillaged by Cortés’ forces after the siege of Tenochtitlan in 1521. There is no record of where it was taken, nor is there any evidence that it belonged to Moctezuma. We don’t even know for sure that it’s a headdress. It doesn’t match any of the headdresses depicted in contemporary accounts. In the 19th century the assumption was that it was a mantle, and recent scholarship suggests they might have been right about it being a mantle, but that it was worn by a priest to ritually transform him into the incarnation of the Aztec god Quetzalcoatl, rather than by the king. What we do know is that by 1575 it was in the extensive private collection of Ferdinand II, Archduke of Austria, at Ambras Castle in Innsbruck. Ferdinand was the nephew of Holy Roman Emperor Charles V who was also King of Spain during the Conquista. He could easily have gotten his hands on the headdress via his family connections. It remained in the castle until the early 19th century when Vienna’s Museum of Ethnology was entrusted with most of the Castle Ambras collection. The headdress was the subject of much anthropological fascination from then on, including from Zelia Nuttall, the American archaeologist, anthropologist and expert in pre-Columbian Mexico who in 1890 first identified it as an Aztec “quetzalapanecayotl” or a featherwork crown. The piece is 46 inches high at the peak and 69 inches wide. In addition to the 400 dramatic quetzal tail feathers that adorn the outer layer, there are rows of blue Lovely Cotinga feathers, pink flamingo feathers, smaller quetzal feathers and white and red feathers from the squirrel cuckoo. The inner rings are studded with gold and gemstones. 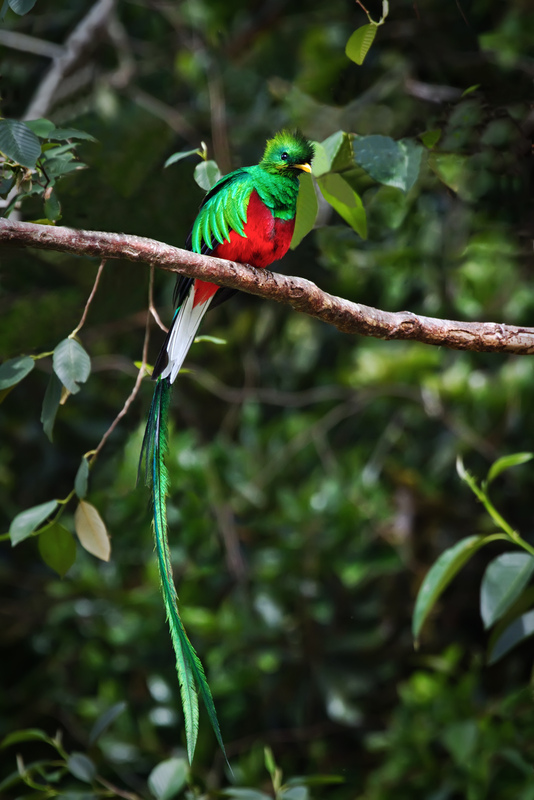 The Aztecs venerated the Resplendent Quetzal as the god of the air, a symbol of rebirth and of freedom. 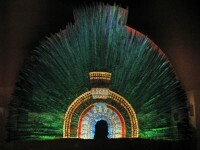 Given its beauty, historical significance and powerful symbolism, it’s no surprise that the headdress has been the subject of a long-standing dispute between Mexico and Austria. There are no Aztec headdresses left in Mexico because the Spanish took them all — the Museo Nacional de Antropología in Mexico City only has a replica of Moctezuma’s headdress on display — so Mexico has been trying for decades to get this one back, even going so far as to petition the United Nations for its return, but to no avail. In 2008, the Mexican Ministry of Foreign Affairs and the National Institute of Anthropology and History (INAH) entered into talks with the Austrian Government and the Kunsthistorisches Museum, the parent institution of the Museum of Ethnology. They agreed first to do an extensive scientific analysis on the headdress to assess its condition and do any conservation necessary that will allow the piece to travel. In 2011, a tentative deal was struck: Mexico would officially recognize Austria’s uncontested ownership of the headdress, Austria would loan Mexico the headdress and in return Mexico would loan Austria the golden stagecoach of Maximilian I of Mexico, emperor of the Second Mexican Empire (1863-1867) and brother of Emperor Franz Joseph I of Austria. There was still one major stumbling block, however. According to Mexican law, all pre-Columbian artifacts belong to the nation. Once they cross the border, no matter who else might lay claim to them, they become property of the state and cannot leave the country. No matter the terms of the loan agreement, Austria had no intention of letting the headdress into Mexico until the government’s assurances had the force of law. A new bilateral cultural exchange agreement between Austria and Mexico that would resolve the issue has just been approved by the Mexican Senate and Austria’s cabinet. The Senate’s amendments to the cultural property law allow for long-term loans of artifacts while acknowledging the lender’s ownership rights. Austria’s legislature has to approve the deal, which is expected to happen within the next few months, and both parties need to sort out how to transport the fragile headdress without damaging it, but it looks like the biggest obstacle to the return of this glorious symbol of Mexican heritage might just have been overcome. The Library of Congress’ online collections of historical images are some of my favorite time sinks. I found a new one this weekend that sucked up hours of browsing time and more hours of researching random tidbits discovered during the browse. 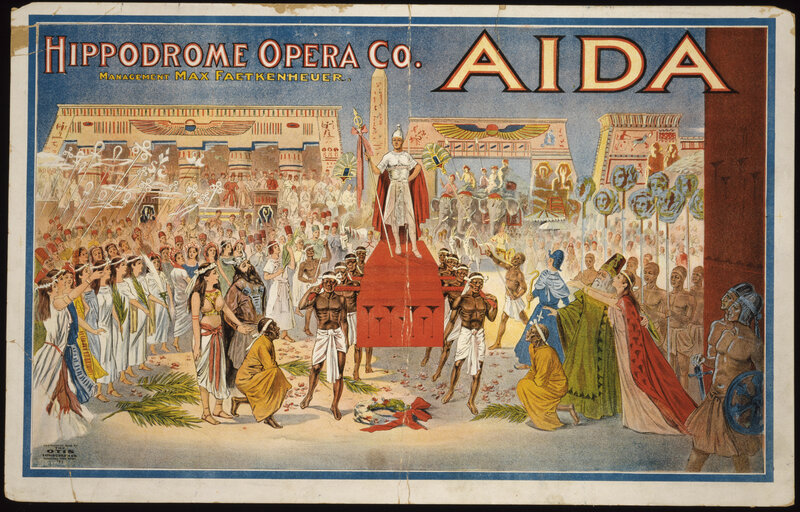 It’s the Performing Arts Posters collection, 2114 publicity posters from live entertainment of the late 19th and early 20th centuries. Most of them are color lithographs or woodcuts that advertise all kinds of performances, from magic shows to splashy theatrical reenactments of historical events to operas. If you have time to burn, I recommend you view all and arrow through the entire collection in alphabetical order. 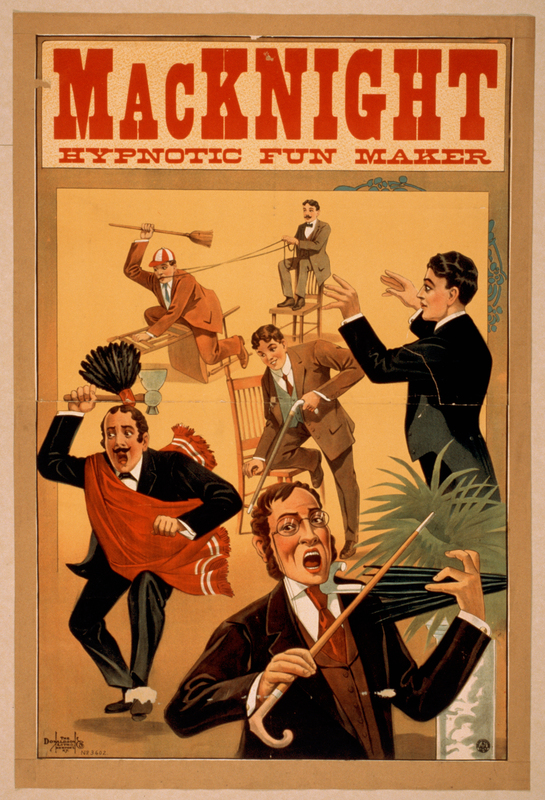 If you do not have eternities to while away, you could browse the three main collections that make up the whole: the Magic Poster Collection, the Minstrel Poster Collection, and the Theatrical Poster Collection, the last of which is subdivided according to genre (Burlesque, Specialty Acts, Vaudeville, etc.). The Magic Poster Collection includes some prestidigitation masters who are still famous today, like Harry Houdini and Howard Thurston, but I have a soft spot for the more obscure acts. Sometimes it’s the little guy who has the best graphics. The Minstrel Poster Collection is, as the name suggests, chock full o’ racist caricatures. Those shows were popular for an incredibly long time. 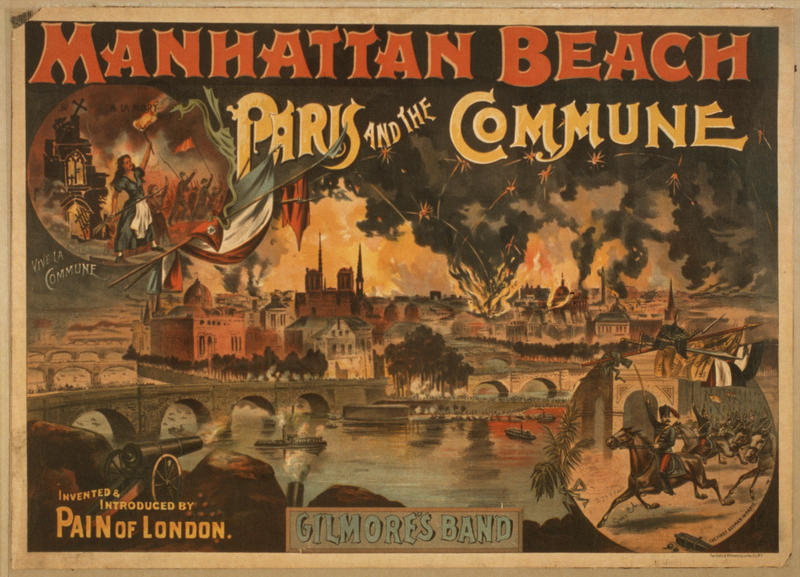 The oldest poster in the collection dates to 1847, the pre-Civil War heyday of white actors blackening their faces with burnt cork and acting like buffoons. 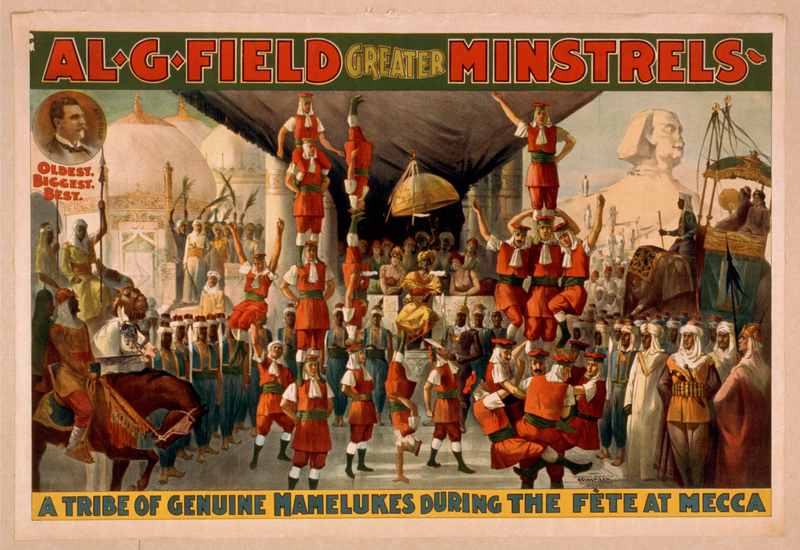 The troupe advertised in the poster, the New Orleans Ethiopian Serenaders (also known as Buckley’s Serenaders after troupe leader James Buckley), were touring England at the time where they were a notable success. 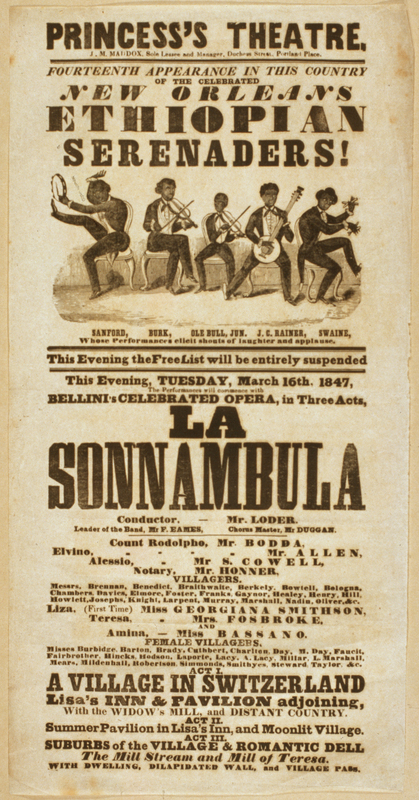 Contrary to the standard song and dance style of minstrel shows, the New Orleans Ethiopian Serenaders’ 1847 performance at London’s Princess Theater kicked off with a burlesque version of the opera La Sonnambula by Vincenzo Bellini. This became something of a trademark for Buckley’s shows even when they returned to the United States and set up permanent shop in a theater on Broadway until it closed in 1862. The Theatrical Poster Collection has the lion’s share of art works, over 1800 posters covering multiple genres of variety stage theater. Of course the Burlesque posters are good unclean fun, but some of the most spectacular graphics come from the Operetta category, especially the D’Oyly Carte’s Gilbert and Sullivan productions, and from the Kiralfy Brothers, a company that staged lavish spectaculars of Biblical stories, famous adventure stories, and quasi-historical re-enactments. Here’s an interesting link that cropped up. 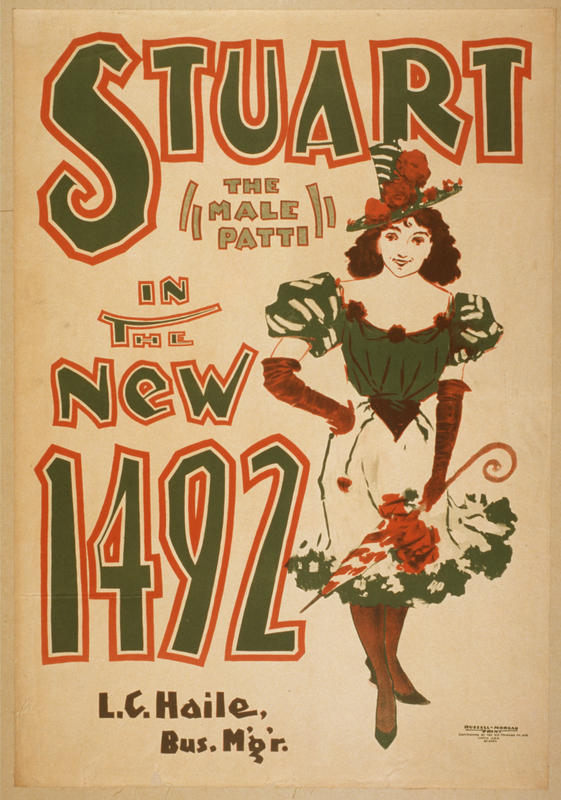 Three of the posters in the Vaudeville category advertise a female impersonator known as Stuart, the Male Patti (1, 2, 3). 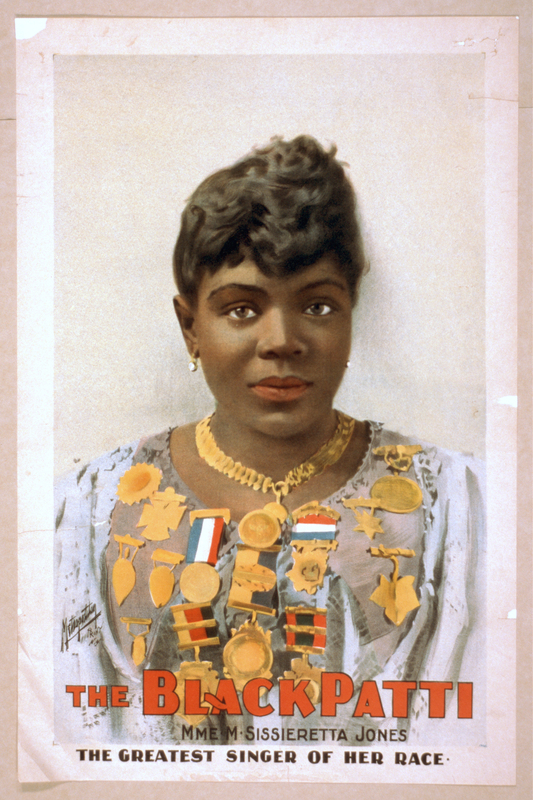 I assumed Patti was another vaudeville performer of the wearing-little-more-than-a-corset-on-stage variety, but then in the Portrait Posters, posters advertising a single star performer, I came across one M. Sissieretta Jones, the Black Patti, “the greatest singer of her race.” A page later and what to my wondering eyes should appear but “the wonderful child singer & actress” Louise Marguerite, aka the Miniature Patti, who I think bears a striking resemblance to a Scarlett Johansson ca. The Horse Whisperer. 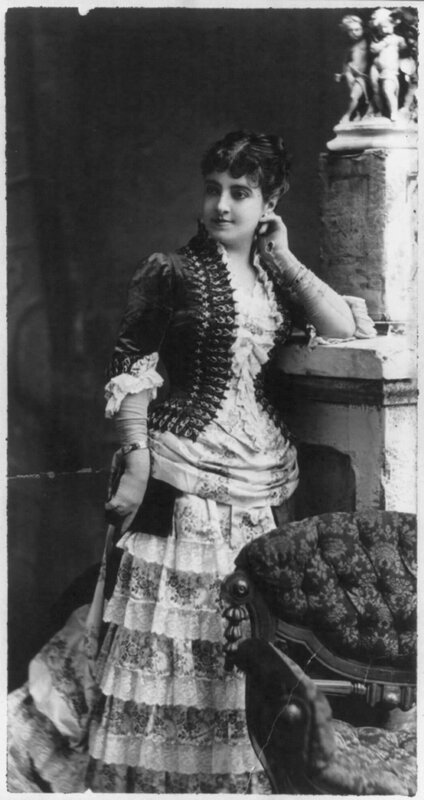 I discovered that Patti was not a Vaudeville performer, but rather a famous Italian coloratura soprano called Adelina Patti. She was something of a prodigy, debuting as Lucia in Donizetti’s Lucia di Lammermoor in 1859 when she was just 16 years old. Two years later, she was invited to perform at Covent Garden in a non-burlesque version of La Sonnambula and was a smash hit. She continued to be a smash for decades, even though her voice changed and deepened as she aged. Verdi adored her, calling her the greatest singer who ever lived. In 1862, she performed the popular song “Home, Sweet Home” at the White House for President Abraham Lincoln and First Lady Mary Todd. They were moved to tears and asked her to sing it again. After that, the song became a signature piece for her. By the time of the male (1898), Black (1899) and child (1894) Pattis, the original Patti was in her 50s singing at her mature peak, making thousands of dollars a night which she insisted be paid to her in gold before every performance. She retired from public performance in the early 1900s, but still put on the occasional private or charity concert. Her bags of gold and smart investments ensured that her retirement was a luxurious one. She died in 1919 and is buried at Paris’ Père Lachaise Cemetery. I very much doubt the other Pattis were so fortunate. I couldn’t find out what happened to Stuart and Louise Marguerite, but Matilda Sissieretta Joyner Jones was a pioneer and a trailblazer. She’s probably the only one of the three who came by her moniker legitimately, since it was Adelina Patti’s manager who saw her perform in 1888 and suggested she take her soprano virtuosity on tour. In 1892 she was the first African American to sing at New York’s Music Hall (renamed Carnegie Hall a year later). That same year she sang at the White House for President Benjamin Harrison. She would sing for the next three presidents after him — Grover Cleveland, William McKinley, Theodore Roosevelt — and for the British royal family. Despite her success as a soprano in Europe and the United States, she soon hit the segregation ceiling. 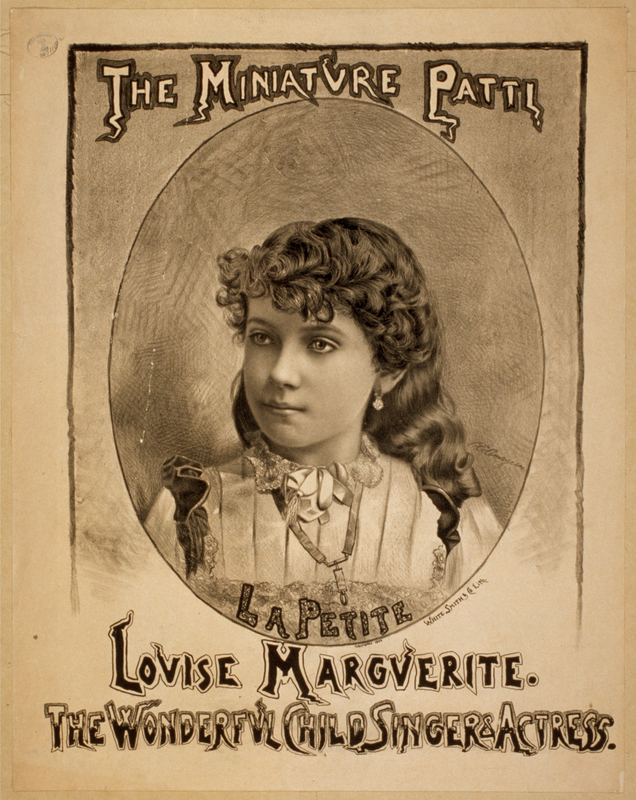 When she found that the major opera houses like the Metropolitan would not hire a black artist, she formed a troupe of her own, the Black Patti Troubadours, and went on the road with a musical review that included vaudeville and minstrel acts as well as greatest hits of opera, not just arias but fully staged scenes. The troupe was a success for two decades and earned her a great deal of money. She retired in 1915 at the age of 46 due to illness and to care for her sick mother in Providence, Rhode Island. The money she had made sadly did not last. Eventually she had to sell all her properties, her awards, and her trophies just to pay the bills. She was 74 and penniless when she died of cancer in 1933. 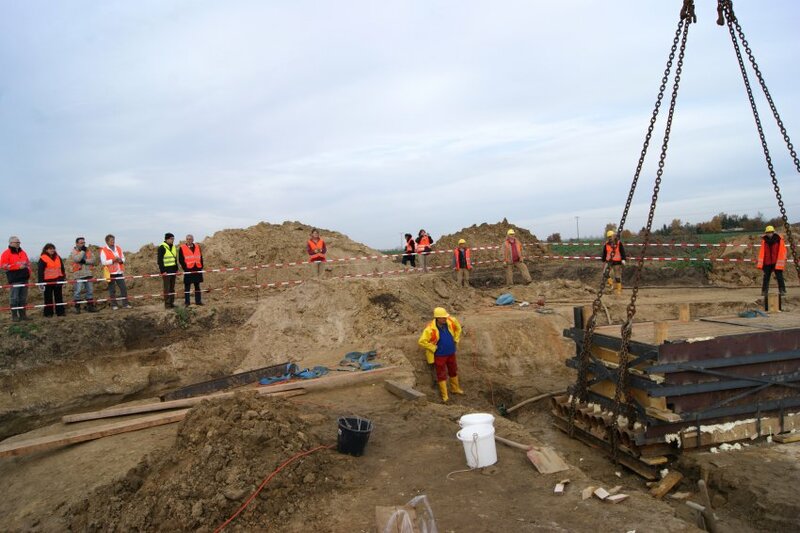 Late in the summer of 2011, archaeologists examining the site of the Battle of Lützen discovered a mass grave thought to contain up to 175 soldiers. The battle between the Protestant forces of King Gustav II Adolf of Sweden and the Catholic Habsburg imperial army led by Czech General Albrecht von Wallenstein took place over four hours in the afternoon of November 16 (according to the Gregorian calendar used by the Catholic Holy Roman Empire and us; November 6 according to the Julian calendar used by the Protestant Swedes), 1632. Although the battle was one of the bloodiest of the Thirty Years’ War, claiming the life of Gustav II Adolf (commissioner of the ill-fated Vasa warship) and 6,000 to 9,000 other men, no bodies have been found before. Archaeologists have already excavated a third of the 1.1 million square meter (3.6 million square foot) field and have discovered thousands of artifacts from the battle. They’ve taken a more high-tech approach to the recovery of the human remains, however. 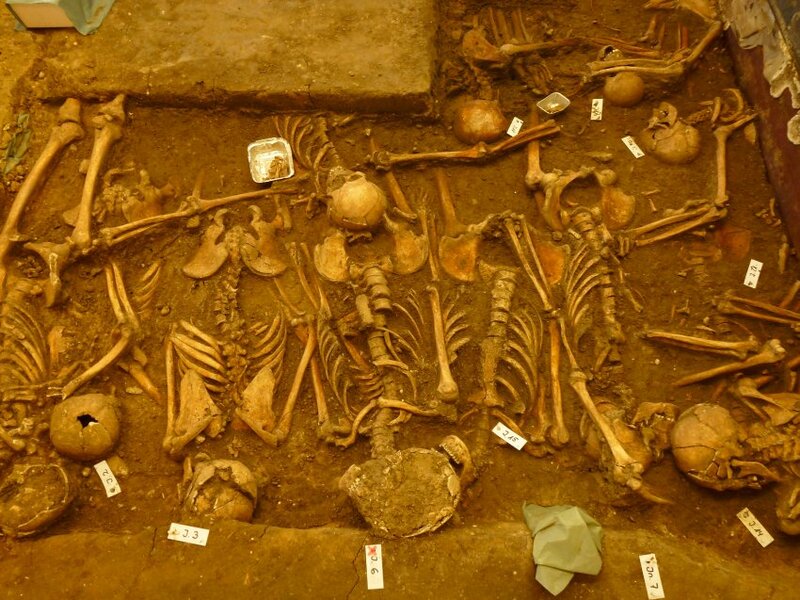 To excavate the mass grave under ideal conditions, without interference from bad weather, hooligans, and environmental contaminants, the entire grave, all 452 square feet and 55 tons of it, was cut out of the earth by heavy machinery. 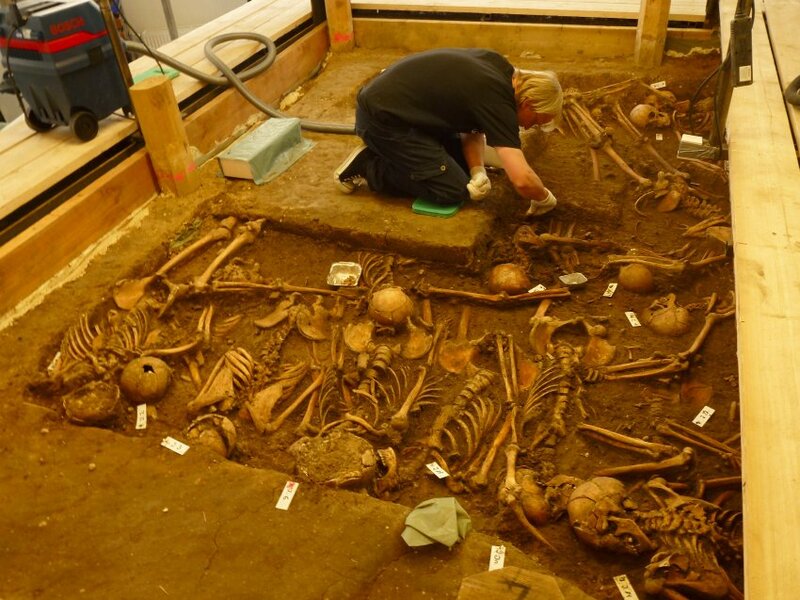 The solid block of soil and human remains was split in two to make it easier to transport, then carried on flatbed trucks to the laboratory of the Saxony-Anhalt State Office for Heritage Management and Archaeology 45 minutes away in Halle. 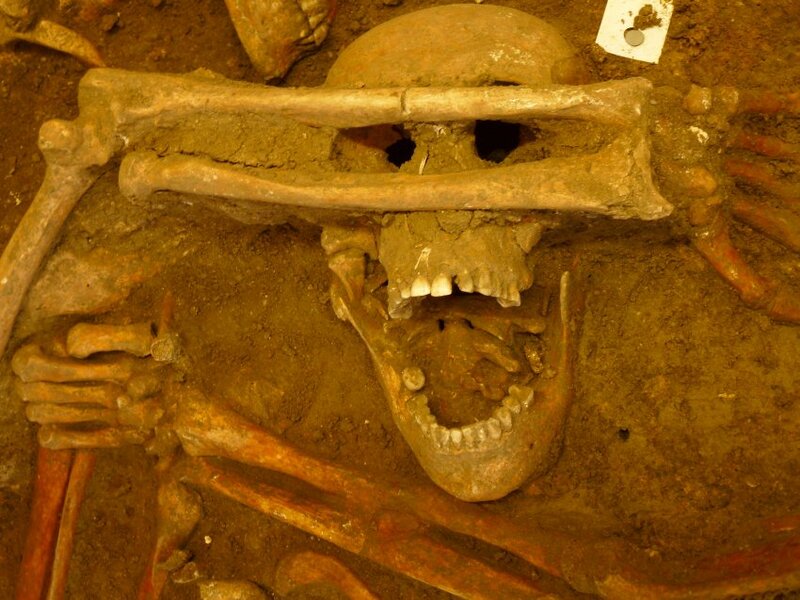 At first archaeologists estimated there were around 75 bodies buried naked, unarmed, close together in layers. After months of close examination in the lab that estimate has more than doubled, but they’re still in the early stages of excavation and only 20 bodies have been unearthed thus far, one layer from one of the blocks. They were indeed buried naked, without weapons or personal effects, close together with their legs facing each other. 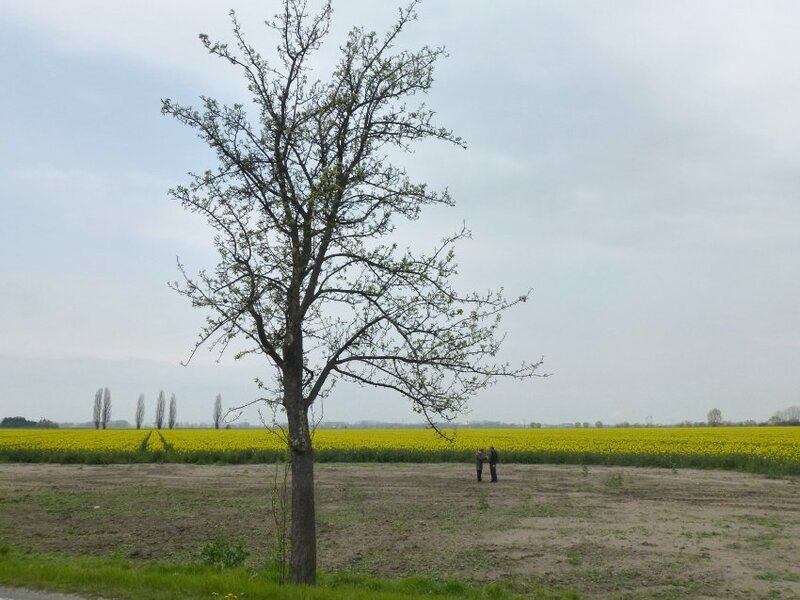 It was the people of Lützen who removed the dead from the battlefield and buried them carefully on the side of the road. The soldiers who survived the battle were immediately shipped off to the next battle. The job was so overwhelming the townspeople asked soldiers in the nearby garrison of Weissenfels to help them. The field and adjacent area is probably dotted with mass graves like this one. Scientists are hoping they’ll be able to determine the nationality of the dead. Soldiers from Scotland, England, Croatia, Germany, Austria, Finland and Sweden all fought in the battle. Strontium isotope analysis on their bones will hopefully provide information on their recent travels, and strontium isotope analysis on their teeth will shed light on where they spent their childhoods. Osteological examination has already returned evidence of perimortem injuries, like skull fractures and a lead bullet recovered from a pelvic bone. The Battle of Lützen was in theory a Protestant victory. Wallenstein’s imperial forces left the field to the armies of the Swedish King who accomplished their primary goal of stopping the Catholic advance into Saxony. 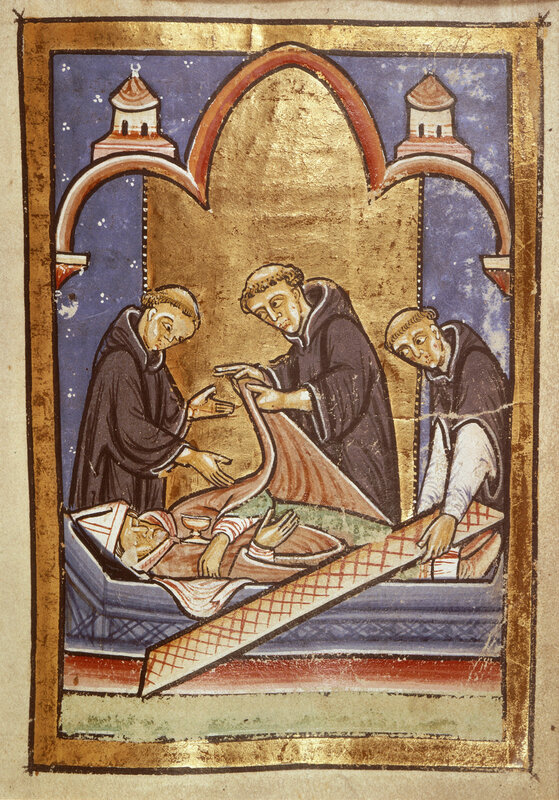 However, the Catholics lost fewer men and most saliently, they didn’t lose their leader. Gustavus Adolphus’ death left the Protestant forces confused and demoralized, leaving the French to take the dominant role in the anti-Hapsburg alliance. The war went on for another 16 years until the Peace of Westphalia finally put an end to it in 1648. The spot on the Lützen battlefield where King Gustav II Adolf fell was marked by a granite boulder the day after the battle. It’s called the Schwedenstein, or Swedes’ Stone, and is still marking the spot today. 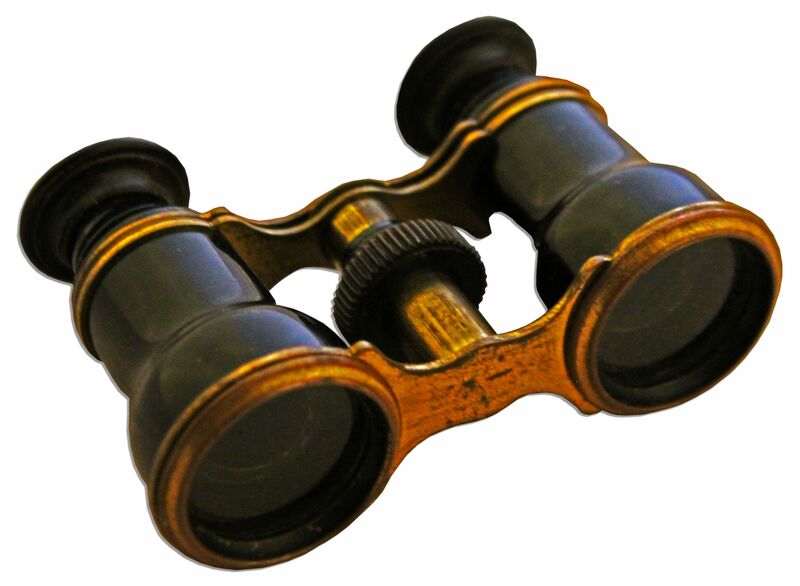 The opera glasses Abraham Lincoln brought to Ford’s Theater to view “Our American Cousin” in binocular close-up on the night he was assassinated are going up for sale at Nate D. Sanders’ April auction. On the night of April 14, 1865, Lincoln was holding the German-made opera glasses when John Wilkes Booth entered the Presidential Box at 10:13 PM and shot him in the back of the head. Three doctors who happened to be at the theater that night attended the mortally wounded President in the box, and then decided to move him. A shockless carriage ride to the White House being out of the question, the doctors, some soldiers in the audience and an on-duty Washington City Guard and Union veteran Captain named James M. McCamly carried Lincoln’s unconscious body across the street to William Petersen’s boarding house. While crossing the street, McCamly saw a pair of opera glasses fall from Lincoln’s body. He picked them up and pocketed them, barely paying attention. He remained at the vigil all night. 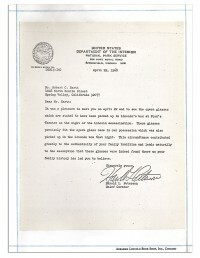 At 7:22 AM, April 15, 1865, Abraham Lincoln died. After the President’s body was brought to the White House, McCamly was relieved of duty and went home to finally get some sleep. It was at his quarters that he realized he still had the opera glasses. Captain McCamly commanded the Veteran Reserve Corps honor guard that accompanied Lincoln’s body back to Springfield, Illinois for the funeral. The men of the honor guard were the only ones allowed to move the coffin. James McCamly was awarded the Congressional Medal of Honor for this somber service. The opera glasses remained in McCamly’s family for three generations until they were sold in 1979 to magazine publisher Malcolm Forbes Sr. 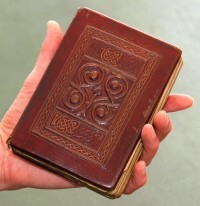 The current owner is anonymous. The last time the glasses were offered for sale in June 2011, with a pre-sale estimate of $500,000 to $700,000, they failed to sell. The Sanders’ estimate is the same exact range, $500,000 to $700,000. It’s three days before the auction and already 14 online bids have brought the price to $252,582. I’m guessing at these prices the National Park Service isn’t in the bidding, which is a big shame because it would be great if the glasses and the case could be reunited in the Ford’s Theater collection. Fingers crossed for a public-minded benefactor. The Glasgow International Festival of Visual Art opened on April 20th, and one particular piece has become a sensation: a life-sized inflatable bouncy Stonehenge. It’s called Sacrilege and was designed by Turner Prize-winning artist Jeremy Deller. He worked with Inflatable World Leisure for two months to create this masterpiece of public art, and although you might think some Scots would be displeased to have an icon of English history on Glasgow Green, in fact people of all ages are having a complete blast on it because it’s undeniably awesome. The installation is deflated at 6pm every night and re-inflated in minutes the following morning. Project manager James Hutchinson said it had caught the imagination of Glaswegians. Deller envisioned it as both an interactive public sculpture and a tactile, playful way to introduce ancient history to young children. The constraints of preservation often by necessity keep people at a distance, including at Stonehenge where visitors are no longer allowed to roam amidst the sarsen stones. A version you can bounce on brings the remote into the immediate. There were bouncings, boundings, hurlings against the megaliths, collapses for a breather, group bounces, hide and seeks. You can’t get near the real thing any more but oh boy, you can get up close and very personal with this one. You can see people starting off just bouncing, then getting more inventive, then teaming up in impromptu mass playfulness and daft game strategies, then splitting and going off in separate directions but somehow lighter footed than when they arrived. Sacrilege will remain in Glasgow until the festival ends on May 7th, then it will travel to various locations in the UK until it arrives in London for the Olympic Games. Whitley Castle, a.k.a. 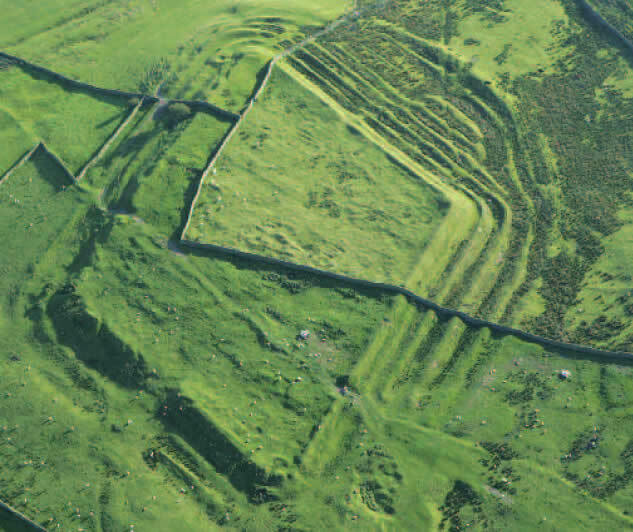 Epiacum, is a Roman fort in Northumberland close to the border with Cumbria, 12 miles south of Hadrian’s Wall. It’s also a scheduled ancient monument, a legal designation that prohibits all excavation on the site. Not even the landowners (Elaine and John Edgar of Castle Nook farm) are allowed to touch the soil. 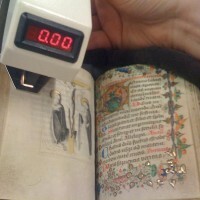 Moles, however, care not for our puny human “laws.” Moles laugh in the court’s collective peruked face and dig with impunity as deep under the fort as their little hearts desire. Seizing the opportunity afforded by the moles’ tireless efforts, a team of 37 volunteers assembled on the site to sift carefully through the molehills for ancient artifacts under the careful supervision of English Heritage whose presence made the sifting legal and who assessed the artifacts as they were found. A jet bead from a Roman necklace or bracelet. Roman pieces that had been brought to the surface by the dirt-churning vigor of the moles were found last year too, including a number of nails that confirmed the fort was not solely built out of stone but also of wood. A visitor on a guided walk stumbled on a small bronze dolphin that might have been part of a bath tap. For now, the Roman artifacts are in the care of Paul Frodshaw, one of the directors of Epiacum Heritage Ltd, a company dedicated to the promotion and development of Epiacum. Elaine Edgar is a co-founder and one of the directors. Frodshaw will catalogue every artifact before returning them to the landowners. Edgar just this month received a £49,200 Heritage Lottery grant which Epiacum Heritage plans to use to raise the profile of the fort as a tourist attraction. The ultimate aim is to have all the artifacts the moles have unearthed be part of an on-site display. Epiacum is the highest stone Roman fort in Britain. Its unique diamond-shaped structure once housed a garrison of about 500 Roman soldiers who were probably in charge of supervising local lead and silver mining operations. It was built at the same time as Hadrian’s Wall (ca. 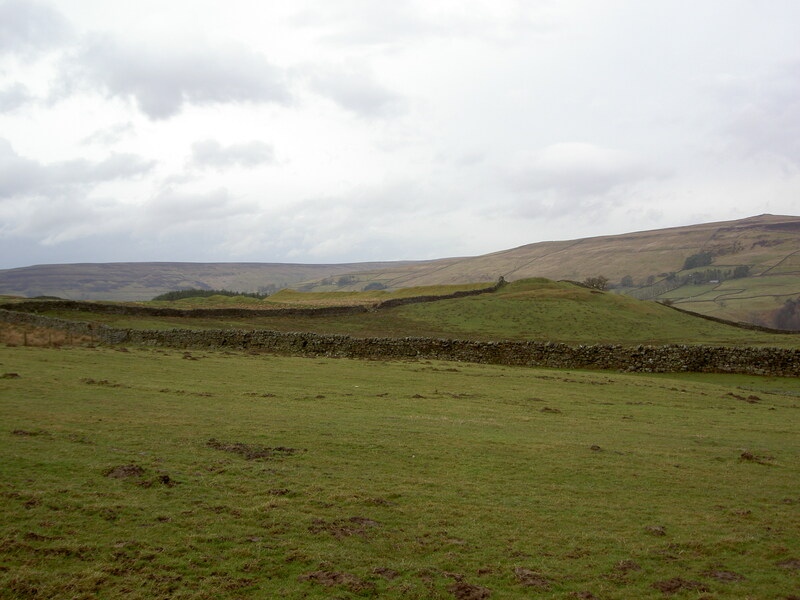 122 A.D.), but the wall a dozen miles away gets thousands of visitors each year, while Epiacum, despite its unusual design, extensive remains including a civilian settlement, a bath house, some of the best preserved stone ramparts in the entire Roman Empire, not to mention the in-house mole archaeologists, goes almost entirely unnoticed. It never really has gotten the attention it is due. Small excavations in the 19th and first half of the 20th centuries turned up a number of important artifacts like intact leather shoes, coins, pottery and altars to Apollo, Hercules, Minerva and Mithras. Nonetheless, even before it became a scheduled monument Epiacum was barely touched. The new corporation has plans to create an interpretation center and hopefully lure tourists to the “hidden gem of the North pennines” but they’ll need to raise more funds to make it happen. 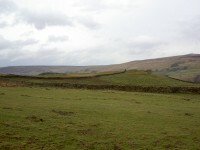 They also need volunteers to help develop the site within the parameters of the scheduled ancient monument designation. For instance, volunteers can help survey the site in more detail, adding to our understanding of the fort and its occupants during its 200 or so years of habitation. If you’re interesting in volunteering, click on the Help Out page of the website and fill in the email form. 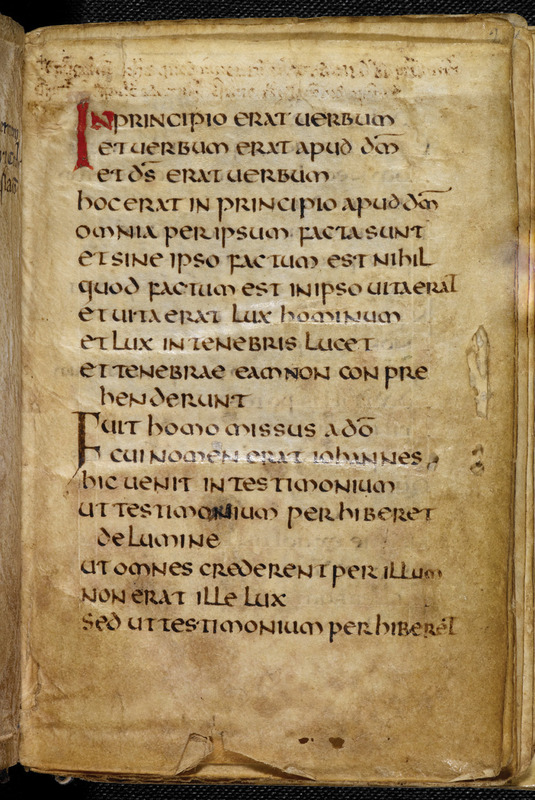 Follow Epiacum Heritage’s progress on Twitter @epiacum. Many thanks to Elaine Edgar for correcting some errors in this entry and for sharing information about Epiacum Heritage’s goals. 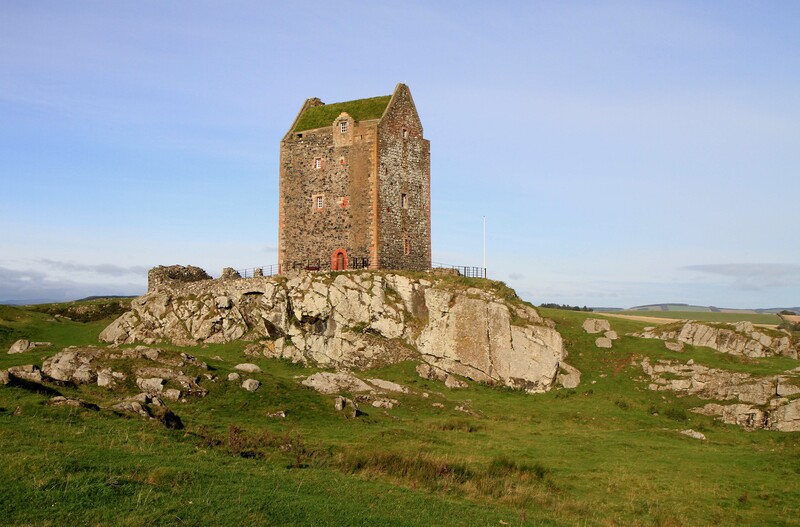 Smailholm Tower is a peel tower, a small, four-story rectangular tower used to warn of and for defense against raids by English and Scottish border reivers. It was built in the first half of the 15th century by the Clan Pringle, whose lairds lived in the tower until it was acquired in the 17th century by the Scott family of Harden. When the Scotts moved to nearby Sandyknowe Farm in the early 18th century, the tower began to fall into ruin. Its decay only enhanced its appeal to wee Walter Scott, future literary giant, whose father sent him to stay with his grandparents at Sandyknowe in 1773 after polio left him lame in one leg when he was just two years old. The fresh air of rural Scotland wasn’t a miracle cure but it did improve his health. By the time he left in 1775 he could walk with a cane, and most importantly for history’s sake, he could read. 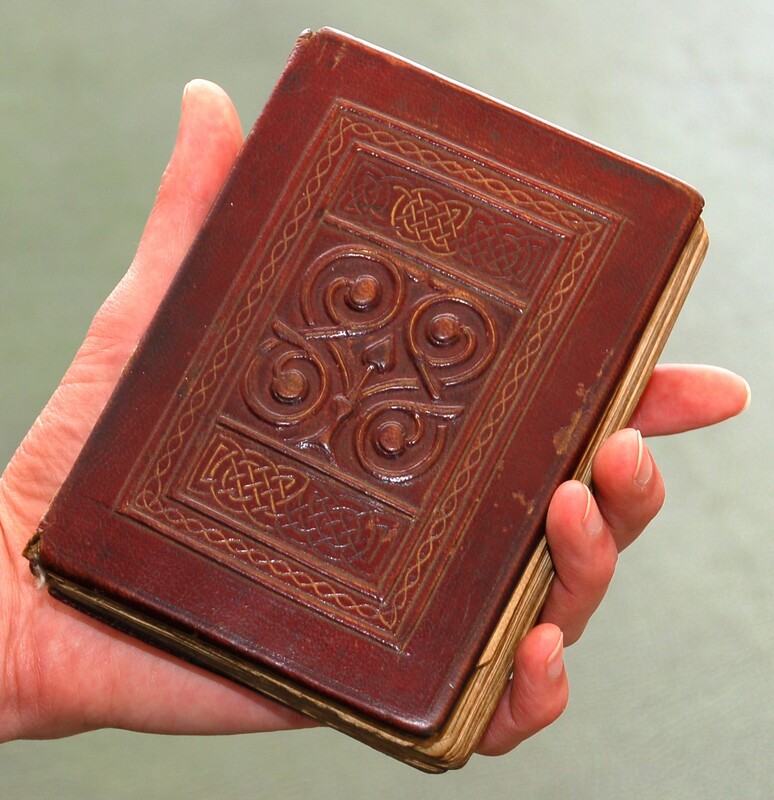 His Aunt Jenny’s stories and the songs and legends of the Scottish Borders he read during long winter visits instilled in him a lifelong love of Scottish folklore. 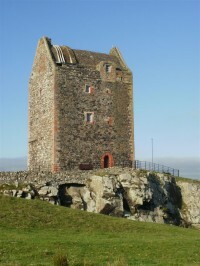 Smailholm Tower, with its dramatic vistas and basalt walls, loomed large in his consciousness. It was the setting for his 1801 poem The Eve of St. John, and makes an appearance in Marmion, his epic poem about the 1513 Battle of Flodden in which several Pringles died. In 1831, ill and just a year from death, Sir Walter Scott would return for one last emotional visit to Smailholm with artist J.M.W. Turner. Despite its historical and literary significance, Smailholm Tower continued to decay. In 1950 it was given to the state by John Sutherland Egerton, 5th Earl of Ellesmere, and various restoration attempts ensued, including a new whinstone rubble roof added in the 1960s over the elliptical stone vault that was originally built to support the long-gone stone slab roof. By 2006, cracks in the rubble roof were leaking water, damaging structural timbers and the top story rooms of the tower. 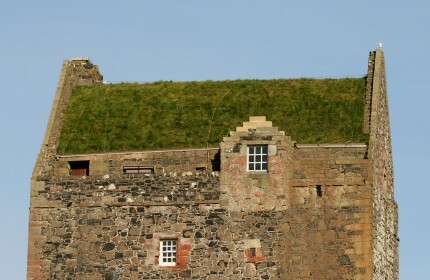 Since rebuilding the original slab roof was not an option due to concerns about whether the current structure could support it and because we don’t know exactly how the original was built, Historic Scotland initiated a project to replace the leaky roof with a grass one that would absorb water. 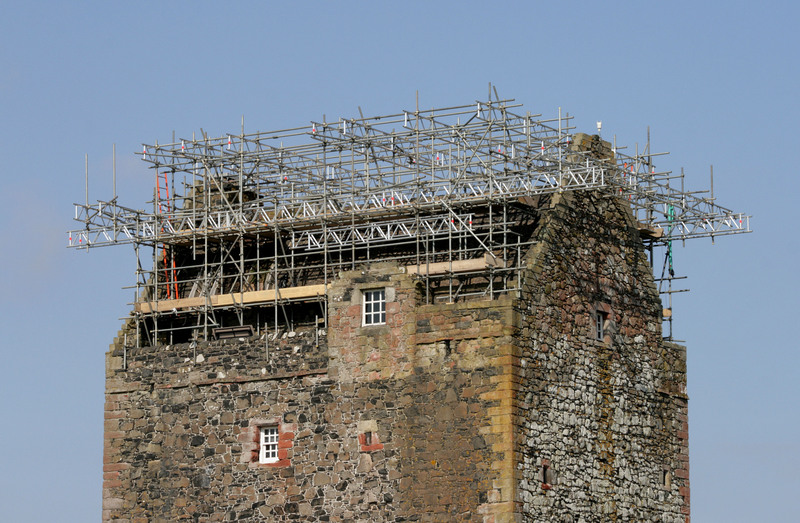 Historic Scotland decided to combine the best features of both specifications to achieve long-term durability. The capping was based on the sedum system but modified to enhance drought resistance, and to encourage the growth of a thicker sward to improve overall rainwater retention. The Tower’s new roof is fully reversible, and replicates evidence of previous vegetation that once grew on the roof, as documented in historic images. So far it is working like a charm. The sedum roof has stopped all water penetration into the tower and it looks fantastic to boot. It’s like a Chia Tower now. Pictures of the roof construction and the lovely new green roof courtesy of and copyrighted by Walter Baxter, who generously allowed me to use the glorious high resolution versions you see above. They are licensed for reuse under this Creative Commons Licence.